When photographing a moving subject such as a dancer, it can be a challenge to convey a sense of graceful motion in a still image. Something as simple as a handful of flour, however, can show off the action in a wonderfully atmospheric way. The fine, white powder hangs in the air, shifting with the action and creating dusty whorls that catch the light. It also makes an almighty mess – to your gear, the surroundings and your plucky subject – but that’s a price worth paying for what it lends your shots. In this tutorial we’ll explain how to get set up and shoot your own flour portraits. You’ll learn how to light the scene and pose your subject before you apply the magic ingredient. Lighting plays a big part, and although it might look like a complicated setup, there are only three inexpensive flashguns at work here, with a couple of modifiers attached to them to diffuse the light. What’s more, you don’t necessarily need a studio. Any decent-sized space will do – you could even shoot it outdoors on a dry night. In fact, there are advantages to not being in a studio, as it makes the clean-up easier if you can hose the area down. The underground car park below PhotoPlus HQ did the job for us – and we managed to escape before any drivers noticed the light dusting of flour over their vehicles! We need a dim environment and a dark backdrop; we shot in an underground car park below the office here. Do what you can to minimise the mess beforehand by arranging tarps and dust sheets. In our three-flashgun setup, the front light is fitted with a white shoot-through umbrella while the back-left light has a silver umbrella and the back-right light a portable beauty dish. All three flashguns are set to Manual mode. We triggered the flashes with a wireless flash trigger attached to one of the flashguns. The other two flashguns are set to Slave mode so that they go off upon detecting the first light. When using off-camera flash we need to use the Manual exposure mode. Use a shutter speed of 1/200sec and adjust aperture and ISO until the exposure looks right. Here, we’re at f/6.3 and ISO 400. We strung up tarps around the shooting area to control the mess. Be aware their colour might affect the light; here, the blue tarps have added a cast to the flour, which you may well find makes the image more interesting. You don’t need to break the bank; inexpensive flashguns like this Yongnuo YN560-IV are fine. Our flashguns only need to have manual exposure and an optical slave mode. You’ll need a wireless trigger and receiver to connect the camera to one of your flashes. Set the others to optical slave mode so they fire at the same time on detecting the master flash. Umbrellas diffuse and spread the light in a wide arc across the subject and scene. A silver umbrella faces away from the subject and creates harder shadows than the white shoot-through type. A beauty dish creates a bank of smooth, direct light. This Interfit soft beauty dish is collapsible and easily portable. If you don’t have a beauty dish, use a silver umbrella or softbox instead. It’s not so much the shutter speed that freezes the motion here, it’s the flash duration. That’s because we’re in a dark car park with no windows, so the only light that matters is the burst from the flashgun, which is quicker than the camera’s maximum flash-sync speed (usually 1/200sec or 1/250sec). The lower the flash power, the faster the flash duration. When fired at full power the duration may even be close to 1/200sec, but at 1/16 power the duration will shrink to around 1/8000sec or faster (depending on your flashgun). So, if you’re seeing motion blur in your flash-lit action shots, lower the flash power and bump up the ISO. We tried two types of flour – just to be scientific about it – but found very little difference between plain and self-raising. Sieving the flour will help it to hang in the air. 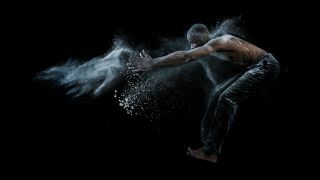 We asked our model PJ to hold the flour in his hands and release it as he moved. To show the movement in different parts of the body, try sprinkling flour over the shoulders, arms and feet. If your subject has long hair, you could try sprinkling it there too. This way it flies off naturally as they move. Keep a few towels on hand to wipe this off between shots. It really helps on a shoot like this if you can work with a subject who knows how to move their body. If you can trust your subject to get into interesting positions, it frees you to concentrate on perfecting the technique, timing and composition. Strong back- and side-lighting gives us these bright highlights along both sides of the body. Pose the subject to make the most of this edge light by asking them to turn the head and body one way or the other as they move. A straight-on pose won’t work here. If you want a subject to stand out against a dark background, try lighting them from behind. This creates a wonderful edge highlight along the side of the figure. It separates the subject from the backdrop and gives the image a filmic quality. Highlighting the edges of the body also draws attention to the shape of the pose, so it’s perfect for photographing dance or action. It’s important to have the light behind the subject angled back towards them, and if you want to keep the backdrop nice and dark, make sure the light doesn’t spill onto it. Here's how to finish off your shots in Photoshop. Duplicate the background layer, then add a Levels adjustment layer and drag the middle slider all the way to the right for a bright image. Highlight the duplicate layer, before grabbing the Burn tool and setting the range to Shadows, then burn the backdrop to black. There’s an easy way to copy the flour from one image to another in Photoshop to create the perfect puffs. Make a loose selection around the flour with the Lasso tool, copy and paste into another image then set the blending mode to Screen.